However, slobbishness is only part of the reason you’re not getting a peek at my actual office. I’d probably take 15 minutes to tidy up a bit and snap a very tightly cropped picture, paper stacks and overflowing bookshelves and all, if I really did most of my writing there. The thing is, I don’t, except when I must, partly because I’m currently sharing the space with a house rabbit who randomly thumps at me and my music, and partly because I have two active kids and find that hiding in the far end of the house with a nearly soundproof door between is us good for my writing but bad for my parenting. You can guess which is more important. 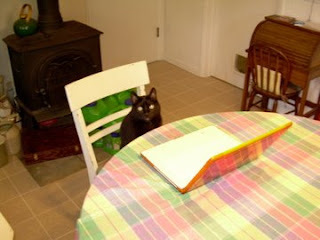 So when I write at home, I tend to plop down at the kitchen table. I love my kitchen. It’s painted a clear, buttery yellow that makes my heart sing, and it’s got a long wall of windows and a door out onto the patio (you can see the pool, or at least the pool cover, through the door). The picture you can see hanging behind the door was painted by the previous owner of our house and goes perfectly with the wall color, even though I got it after I painted. I like that, and I like the fact that I can see or hear pretty much everything that’s going on in the house. Another thing I like about the kitchen is that the cats, who aren’t allowed out with the bunny, can and do hang out nearby and help me write. The grey one trying to engineer an escape from the back of the chair out the door is Zelda, and the black one trying to figure out the keyboard is Clouseau. Both are rescue kitties, one rescued by Animal Control and adopted at PetSmart, one by us outside a local buffet restaurant when he strolled up to say hello. Anyway, the kitchen is where I do most of my writing at home, but during the school year or when the kids are otherwise occupied, I typically don’t write at home. At home, too many distractions raise their colorful heads, beckoning me away from the agony of getting the movie in my head to come out right on paper. To counter this, I find shelter elsewhere, anywhere, so long as people will leave me alone. This morning, while my daughter went off to Young Authors camp—apparently the aberration is genetic, because she begged to go—I spent three hours with my laptop at Donut Country (no donuts, thank you, but a huge iced coffee). Noisy as it was, no one wanted to talk to me, which is, after all, the critical factor for a good writing retreat. I’ve developed a panorama of such anonymous locales, and I actually posted about them on my personal blog a while back. Some of my favorites are fairly typical, while others are, ahem, odd, so if you’re interested or would like to see one of my favorite writing tools, check it out here. So, I’ve come out the slob closet. Would anyone else care to raise their hand and join me? Or does anyone else have a good/unusual place that they write? If so, please share in comments. I can always use another idea for somewhere to go. After all, it’s only 70 more days until school starts again. Um, Lisa, I think it’s cheating to confess to being a “slob” and then post photos of a beautiful, pristinely neat dining room. I’m going to have to do some creative Photoshop doctoring on my office or totally lose face. LOL! Your cover hero is definitely hunky! I don’t have any unusual writing places to add to your list. My office is pretty much it. Can totally relate to the rescued kitties that “help” you write. My critters are dogs, and fortunately don’t make it to the keyboard too often! I’m with you, Maggie. Too many outside distractions compete with the distractions in my head. Lisa, your daughter is sooo lucky to go to Author Camp. I started writing when I was young but didn’t get much direction until later in life. Do you think early instruction refines writing in young people… or dilutes the internal drive to write? I suppose it depends upon the teacher. Did anybody else have a mentor or teacher early on that directed your writing? Well, the kitchen table was clean only because my daughter had a guest coming over. I had her carry the pile of newspapers out to the recycle bin, and I carted away a basket full of stuff to an unnamed location that’s not in the camera view. What you can’t see is the desk/pile off to the right, where I keep all the glues, papers, and miscellaneous junk I use in my altered books (yes, I destroy them as well as write them), the three giant green jugs of kitty litter by the wood stove (actually, you can just glimpse them on the floor behind Clouseau), and the kitchen counter to the left, which should be declared a safety hazard for unrestrained stacking. Young Authors Camp is sponsored by Oregon Writing Project (http://www.willamette.org/owp/). One of the teachers from my daughter’s middle school runs the program every year, and brings in volunteers, young and old, to help with the kids. It’s just a week long, half days, but my kid loves it and writes up a storm (she’s on her dad’s computer, composing something for the collection they publish at the end as I write this). Definitely free-form writing at this level, but they do get some guidance, and I love that she enjoys it so much.